I didn't make any bento yesterday because it was a public holiday here. Yesterday, I went to a Korean supermarket near our house and bought a pack of Korean mixed grains rice to make today's bento. We love Korean foods. We have this Korean restaurant called Hanwoori, very close to our house (only 5 minutes drive) owned by a Korean family. The couple is very friendly to the kids. The wife always comes to our table and chats with the kids. Andrew's favorite is Soluntang and Audrey loves Bokkeumbap and Jap Chae. She even loves the Kimchi Jigae now. As this is the first time to introduce Kongbap (mixed grains rice) to my girl, I made 2 heart shapes onigiri. 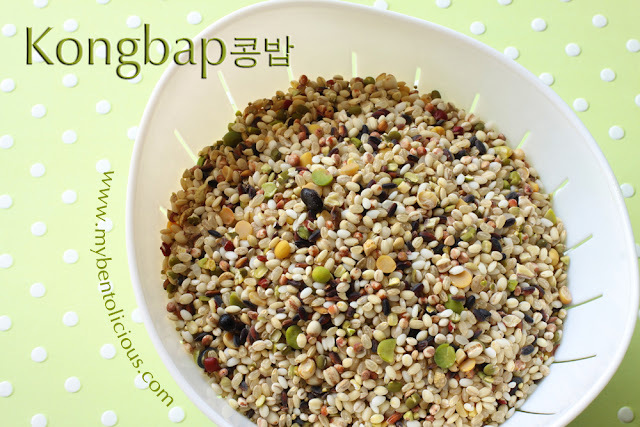 The Kongbap contains 14 kinds of nutrition for a healthy diet. At least that's what I read from the package. And the package contains barley, rice, brown rice, black rice, sorghum, buckwheat, mung bean, and millet. The mixed grains rice tastes very good, a bit sweet with a rich texture in it. I added 2 characters boy and girl with the hands positioned like make a heart shapes. If you love to watch K-Drama then you will know that they usually do this and say 'saranghae' - is Korean to say I Love You. Inside the other box : heart shapes tamagoyaki, cherry tomato, stir fried carrot & cabbage with onion, and ebi katsu with shiso leaves. How do you make the 2 tone tamagoyaki? Kongbap looks cool; I love mixed grains rice! And the girl hearts are sweet! Beautiful bento! Wow, I love kongbap and I agree with you about the texture and taste. Healthy plus cute! You've successfully created both in a single lunch. Genius! it's so cute! and healthy! How does Kongbap taste? Nutty like Brown rice? aaahhh, I bought this too some time ago. I love the boy and girl figures...they are lovely...Saranghae..! @diva : Thanks a lot for your kind comment! @Vanessa : hehehe ... You can say that too if you like. Thanks a lot Vanessa! Your characters are so cute! I've never made kongbap before, can you put it in a rice cooker? It looks delicious! @princess n princess mum : Healthy, so nutritious indeed! So full of hearts bento!!! The two color tamagoyaki is just fantastic ^_^. very cute and so healthy. @SIG : Thanks a lot! so cute! I love how you did the hair. Was that free hand? I just love your heart shapes tamagoyaki!! So special. I love the mixed grains too and often mix it myself. It's nice to see what others use in their mix. Everything looks so good! Oh so a cute bento again. And the Kongbap looks good. glad your kids are eating so many korean foods -- they can be so healthy and comforting! Lovely bento as always, Lia! I loved your description of the sweet Korean restaurant, nice to read that you have a special and freindly place to enjoy yummy Korean dishes! Also, great reminder of healthy kongbap--must add that to the fall menu! Best wishes!! i like all your bento creations Lia, it's really hard to pick what's my favorite because all of them are truly cream of the crop of all bentos! i admire 3 bento makers luckysundae, hippoPAPA+ MAMA, and of course Lia Chen (*teehee*). Beautiful bento and the rice is gorgeous! I'm going to have to get some for myself! @3snahousedesign : Esna, 정말 감사합니다 ! You are totally amazing, Lia! I love the heart shape tamagoyaki. How in the world did you do that? I was just looking through the Tips section of your blog, it is so helpful! This weekend I will try making egg sheet. I am really excited to try it! And I definitely think you could make a book, you are so talented. The girl n boy are so cute, I love the long haired girl with the flower, so sweet. Must try the Korean mixed grain but doubt the kids will eat it. Oh my gosh that is so freaking cute!! I agree with SusanK, I am also fascinated at how organized, neat and even spontaneous your bentos look! You come up with the most creative imagery. Did you know, when I was growing up.. I thought the word 'love' did not exist in the korean language because my parents were so old fashioned, they never said it to us kids. Never. Someone once told me, 'sarangheyo' and I asked what this meant to my mom and she said, 'oh that just means I love you'. Haha! Wow. Guess it's not that big on her list. lol. This is sooooo cute. I hope Audrey enjoyed her kongbap hearts! Hope you all enjoyed your weekend too!